Except for the Mexican League, teams in the organized minor leagues are generally independently owned and operated but are directly affiliated with one major league team through a standardized Player Development Contract (PDC). These leagues also go by the nicknames the "farm system," "farm club," or "farm team(s)" because of a joke passed around by major league players in the 1930s when St. Louis Cardinals general manager Branch Rickey formalized the system, and teams in small towns were "growing players down on the farm like corn." Major League Baseball and Minor League Baseball teams may enter into a PDC for a two- or four-year term. At the expiration of a PDC term, teams may renew their affiliation, or sign new PDCs with different clubs, though many relationships are renewed and endure for extended time periods. For example, the Omaha Storm Chasers (formerly the Omaha Royals and Omaha Golden Spikes) have been the Triple-A affiliate of the Kansas City Royals since the Royals joined the American League in 1969, but the Columbus Clippers changed affiliations, after being associated with the New York Yankees from 1979, to the Washington Nationals in 2007 and have been affiliated with the Cleveland Indians since 2009. A few minor league teams are directly owned by their major league parent club, such as the Springfield Cardinals, owned by the St. Louis Cardinals, and all of the Atlanta Braves' affiliates except the Florida Fire Frogs. Minor League teams that are owned directly by the major league club do not have PDCs with each other and are not part of the reaffiliation shuffles that occur every other year. Today, 19 affiliated minor baseball leagues operate with 244 member clubs in large, medium, and small cities, as well as the suburbs of major cities, across the United States, Canada, Mexico, and the Dominican Republic. Several more independent leagues operate in the United States and Canada. The earliest professional baseball association, the National Association of 1871 to 1875, comprised all fully professional teams. This system proved unworkable, however, as there was no way to ensure competitive balance, and financially unsound clubs often failed in midseason. This problem was solved in 1876 with the formation of the National League, with a limited membership which excluded less competitive and financially weaker teams. Professional clubs outside the National League responded by forming regional associations of their own. There was a series of ad hoc groupings, such as the New England Association of 1877 and the Eastern Championship Association of 1881. These were loose groups of independent clubs which agreed to play a series of games for a championship pennant. The first minor league is traditionally considered to be the Northwestern League of 1883 to 1884. Unlike the earlier minor associations, it was conceived as a permanent organization. It also, along with the National League and the American Association, was a party to the National Agreement of 1883. Included in this was the agreement to respect the reserve lists of clubs in each league. Teams in the National League and the American Association could only reserve players who had been paid at least $1000. Northwest League teams could reserve players paid merely $750, implicitly establishing the division into major and minor leagues. Over the next two decades, more minor leagues signed various versions of the National Agreement. Eventually, the minor leagues joined together to negotiate jointly. In the late 1890s, the Western League run by the fiery Ban Johnson decided to challenge the National League's position. In 1900, he changed the name of the league to the American League and vowed to make deals to sign contracts with players who were dissatisfied with the pay and terms of their deals with the National League. This led to a nasty turf war that heated up in 1901 enough to concern Patrick T. Powers, president of the Eastern League, and many other minor league owners about the conflict potentially affecting their organizations. Representatives of the different minor leagues met at the Leland Hotel in Chicago on September 5, 1901. In response to the National–American battle, they agreed to form the National Association of Professional Baseball Leagues, called the NAPBL, or NA for short. (The NA uses the name Minor League Baseball today.) The purpose of the NA at the time was to maintain the independence of the leagues involved. Several did not sign the agreement and continued to work independently. Powers was made the first president of the NAPBL, whose offices were established in Auburn, New York. In 1903, the conflict between the American and National Leagues ended in the National Agreement of 1903. The NAPBL became involved in the later stages of the negotiations to develop rules for the acquisition of players from their leagues by the National and the American. The 1903 agreement ensured that teams would be compensated for the players that they had taken the time and effort to scout and develop, and no NA team was required to sell their players, although most did because the cash was an important source of revenue for most teams. The NA leagues were still fiercely independent, and the term "minor" was seldom used in reference to them, save by the major-market sports writers. News did not travel far in the days before television and radio, so, while the leagues often bristled at the major market writers descriptions, they viewed themselves as independent sports businesses. Many baseball writers of that time regarded the greatest players of the minor leagues, such as Buzz Arlett, Jigger Statz, Ike Boone, Buddy Ryan, Earl Rapp and Frank Shellenback, as comparable to major league players. Leagues in the NA would not be truly called minor until Branch Rickey developed the first modern farm system in the 1930s. The Commissioner of Baseball, Kenesaw Mountain Landis fought Rickey's scheme, but, ultimately, the Great Depression drove teams to establish systems like Rickey's to ensure a steady supply of players, as many NA and independent teams could not afford to keep their doors open without the patronage of major league baseball. The leagues of the NA became subordinate to the major leagues, creating the first minor leagues. Other than the Pacific Coast League, which under its president Pants Rowland tried to become a third major league in the Western states, the other leagues maintained autonomy in name only, being totally economically dependent upon the American and National leagues. In 1922, the United States Supreme Court decision Federal Baseball Club v. National League (259 U.S. 200), which grants baseball a special immunity from antitrust laws, had a major effect on the minor leagues. The special immunity meant that the American and National leagues could dictate terms under which every independent league did business. By 1925, major league baseball established a flat-fee purchase amount of $5,000 for the contract of any player from an NA league team. This power was leveled primarily at the Baltimore Orioles, then a Triple-A team that had dominated the minors with stars. 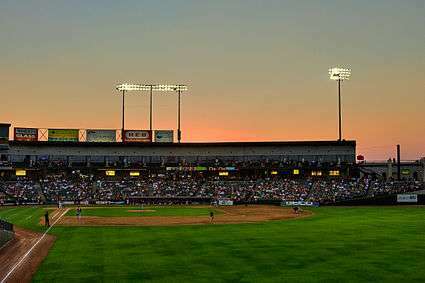 The third base stands of the Dell Diamond, home of the Round Rock Express. Under most circumstances, minor league teams are not owned by major league clubs, but have affiliation contracts with them. A small number of minor league clubs are directly owned by major league clubs, but these are rare. Major league Rule 56 governs the standard terms of a Player Development Contract (PDC) which is the standard agreement of association between a minor league team and its major league affiliate. Generally, the parent major league club pays the salaries and benefits of uniformed personnel (players and coaches) and bats and balls, while the minor league club pays for in-season travel and other operational expenses. Minor league teams often change their affiliation with major league clubs for a variety of reasons. Sometimes major or minor League clubs wish to affiliate with a partner that is geographically closer. In recent years, some MLB clubs have attempted to place as many affiliated teams within their blackout area as possible, in order to make scouting and player transfers more convenient and to take advantage of the existing fan base when interest in the parent team builds support for the minor league affiliate and early fan interest in developing minor league players reinforces support for the parent team as "local players" reach the majors. Sometimes a minor league club wishes to improve the caliber of players its major league affiliate sends to play there. Sometimes a major league club wishes to improve the facility where it will send its developing players. In even-numbered years, any major or minor league club with an expiring PDC may notify Major League Baseball or Minor League Baseball, respectively, of its desire to explore a re-affiliation with a different PDC partner. The Major League Baseball and Minor League Baseball offices then send a list of the corresponding major and minor league clubs seeking new affiliations, and there is a limited period of time in September within which clubs may agree upon new PDCs. If any are left over after this process, the Major League Baseball and Minor League Baseball offices are empowered to assign major and minor league clubs to each other. Going into the 2010 season, the longest continuous link between major league and minor league clubs was the link between the Orioles and their Rookie-level Appalachian League affiliate, the Bluefield Orioles. The teams were affiliated for 53 years, from 1958 through 2010. Baltimore ended the PDC after the 2010 season. 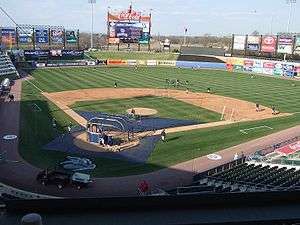 At the start of the 2011 season, the longest continuous affiliations were two 45-year links: between the Philadelphia Phillies and their Double-A Eastern League affiliate, the Reading Fightin Phils; and the one between the Detroit Tigers and their Single-A Florida State League affiliate, the Lakeland Flying Tigers. Both Reading and Lakeland are owned by their parent Major League clubs. There are several baseball clubs that operate teams at multiple levels of the minor leagues; they are not required to affiliate all of their clubs to the same major league franchise. Bob Rich, Jr., for example, owns the AAA Buffalo Bisons and the short-season West Virginia Black Bears, the latter of which had been the Jamestown Jammers before the 2015 season. Even though the teams were located slightly more than 70 miles (110 km) apart before the Jammers' relocation, Rich has never affiliated the two teams with the same parent club. The current minor league classification system divides leagues into one of five classes, those being Triple-A (AAA), Double-A (AA), Class A (Single-A or A), Class A Short Season, and Rookie. Furthermore, Class A is further subdivided into Class A and Class A-Advanced (often called Low-A and High-A, respectively), and Rookie is further subdivided into Rookie Advanced, Complex-based Rookie and international summer baseball. Under the rules governing the affiliated minor leagues (specifically Major League Baseball Rule 51), Class A Short Season is a separate classification from the other leagues bearing the "Class A" name, despite the similarity in name. This classification currently includes two affiliated leagues: the International League and the Pacific Coast League, which feature teams from Eastern and Western United States respectively. For most of the 20th century, it also contained the American Association, based in the Midwest, but that league disbanded in 1997 as part of a reorganization of the Triple-A level that saw the American Association clubs absorbed by the IL and PCL. The Mexican League is also classified as a Triple-A league, though its clubs do not have PDCs with Major League clubs. Both young players and veterans play for Triple-A teams. Teams usually hold many of the remaining 15 players of the 40-man major league roster whom the major league club has chosen not to play at the major league level. Players at Triple-A on the 40-man roster can be invited to come up to the major league club once the major league roster expands on September 1, although teams usually wait until their affiliates' playoff runs are over, should they qualify. For teams in contention for a pennant, it gives them fresh players. For those not in contention, it gives them an opportunity to evaluate their second-tier players against major-league competition. Some Triple-A players are "career minor leaguers", former prospects whose skill growth has halted and are not likely to be ready for MLB action unless as a temporary replacement. Unlike the major league and the Triple-A level, two of the three Double-A leagues play a split season, the Eastern League being the exception. One team may clinch a spot in the playoffs by winning the division in first half of the season. The teams' records are then cleared and another team will also clinch a playoff slot during the second half. Wild cards are used to fill out the remaining teams. Usually, four teams qualify for the league playoffs. This system is used at the Class A level as well. One level below Double-A, the California League, Carolina League, and the Florida State League play at the Class A-Advanced level, also known as Class A+. This is often a second or third promotion for a minor league player, although a few high first-round draftees, particularly those with college experience, begin at this level. These leagues play a complete season like Triple-A and Double-A, April through early September. Many of the teams in the Florida State League are owned by major league parent clubs and use their spring training complexes. The class consists of 30 teams from around the United States, from San Jose to Tampa. Slightly below Class A-Advanced are the full season Class-A leagues, the South Atlantic League and Midwest League. These leagues are a mix of players moving up from the Short Season and Rookie leagues, as well as the occasional experienced first-year player. These leagues play a full, 140 game schedule, which runs from the first week of April through the first week of September. Short season leagues, as the name implies, play a shortened season of 76 games, starting in mid-June and ending in early September, with only a few off-days during the season. The late start of the season is designed to allow college players to complete their college seasons in the spring, then be drafted, signed, and immediately placed in a competitive league (The MLB First Year Player Draft begins on the first Monday in June). Players in short season leagues are a mixture of newly signed draftees who are considered more advanced than other draftees, and second-year pros who were not ready or for whom there was not space at a higher level to move up. Second-year pros are assigned to "extended spring training" in Florida or Arizona during April and May before reporting to their short season leagues. Of the 30 major league clubs, 13 field teams in Class A Short Season only, 8 clubs field their top short season teams in the Rookie Advanced leagues, and 9 clubs have affiliates at both levels. Class A Short Season, despite the name, is a separate classification from Class A. Class A Short Season teams are slightly more limited than Class A teams with respect to player age and years of experience in professional baseball. There are two short season leagues, the New York–Penn League and Northwest League. Leagues in the Rookie classification play a shortened season, similar to, but slightly shorter than, the short season leagues, starting in mid-June and ending in late August or early September. This lowest level of minor league baseball consists of two domestic leagues, the Arizona League and Gulf Coast League, and one foreign-based league, the Dominican Summer League. Players on the disabled list (DL) can be sent to the minor leagues to aid in rehabilitation following an injury, typically for one or two weeks. Players are often sent to minor league clubs based on geography and facilities, not necessarily by class for these reassignments. Curt Schilling's recovery from an ankle injury in 2005 saw him rehab in Pawtucket, Rhode Island at the Triple-A Pawtucket Red Sox, very close to the home club in Boston. The Cincinnati Reds often send players to their Class-A affiliate, the Dayton Dragons, for rehab assignments. Despite Dayton's status as Low Class-A, Dayton is a short, 50-mile drive away from the Reds' Great American Ball Park. Minnesota Twins superstar Joe Mauer, who missed most of the first two months of the 2011 season due to a difficult recovery from arthroscopic knee surgery after the 2010 season, reported to Minnesota's Class-A Florida State League team, the Fort Myers Miracle, which is based in their well-equipped Spring Training facility in Fort Myers. In addition, the Miracle manager at the time was Mauer's older brother Jake. The Twins would later send Joe Mauer and pitcher Ricky Nolasco to rehab with the club's Low-A affiliate located across the Minnesota-Iowa border in Cedar Rapids. Prior to 1963, the Class A level was a higher-rung classification. In 1946, Class A consisted of the Eastern League and the original South Atlantic or "Sally" League, and it would soon include the Western League (1947–1958), the Central League (1948–1951), and the Western International League (1952–1954). The WIL became the Class B Northwest League in 1955, and the Western and Central loops folded. But postwar Class A cities included communities such as Denver, in Major League Baseball since 1993, as well as Vancouver, Omaha, Colorado Springs, Scranton and Allentown, which would establish themselves as Triple-A venues. Double-A: In 1964, the South Atlantic League changed its name to its current identity, the Southern League. Because of continued contraction (and Major League expansion) that left each circuit with only seven teams, the Texas and Southern leagues merged into an umbrella circuit, the Dixie Association, in 1971. The arrangement lasted only for that season and the records and history of the Texas and Southern loops were kept distinct. In 1972, each league added an eighth team, rebalancing their schedules. They resumed their former, separate identities, and returned to prosperity with the revival of minor league baseball that began in the 1980s. Class A: In 1965, the Class A–Short Season designation was created, and the Northern and Northwest loops moved from "full season" Class A into the new classification (with the New York–Penn League following in 1967). The Georgia–Florida League disbanded after the 1963 season, while the Northern League played its last year in official minor league baseball in 1971. In 1980, the Western Carolinas League changed its identity to become the modern incarnation of the South Atlantic League. Rookie: In 1964, the Pioneer League stepped down from Class A to Rookie league status, and the first "complex-based" leagues, the Sarasota Rookie League and the Cocoa Rookie League, made their debuts. The Sarasota Rookie League underwent a name change to the Florida Rookie League in 1965 before becoming the modern Gulf Coast League the next season. The Cocoa Rookie League lasted only one season, but the Florida East Coast League of 1972 was based in the same region of the state. In 1989, an Arizona-based counterpart to the Gulf Coast League, the Arizona League, made its debut in minor league baseball, and it continues to operate as a Rookie-level league for MLB teams with spring training facilities based in that state. The Pacific Coast League, from 1952–1957, was the only minor league to obtain open classification. At this time, the major leagues only extended as far west as St. Louis and as far south as Washington, D.C. This classification severely restricted the rights of the major leagues to draft players out of the PCL, and at the time it seemed like the PCL would eventually become a third major league. The PCL would revert to Triple-A classification in 1958 due to increasing television coverage of major league games and in light of the Dodgers and Giants moving to Los Angeles and San Francisco, respectively. The open classification no longer exists in the major league rules. The forerunner to the modern Double-A classification, the A1 level existed from 1936 through 1945. In 1936, two Class A circuits, the Texas League and the Southern Association, were upgraded to Class A1 to signify their continued status as one step below the highest classification, then Double-A, yet a notch above their former Class A peers, the New York–Pennsylvania League and Western League. Ten years later, after World War II, with the minor leagues poised for unprecedented growth, classification terminology was changed. Beginning in 1946, the three Double-A leagues (the American Association and International and Pacific Coast leagues) joined a new classification, Triple-A, and the Class A1 level became known as Double-A. Until 1963, there were also Class B, C, and D leagues (and, for half a season, one E league). The Class D of that day would be equivalent to the Rookie level today. The other class designations disappeared because leagues of that level could not sustain operation during a large downturn in the financial fortunes of minor league baseball in the 1950s and 1960s caused by the rise of television broadcasts of major league sports across broad regions of the country. The impact of the Korean War in 1950 caused a player shortage in most cities in class D and C. The Class E level existed briefly in 1943 in the form of the Twin Ports League. It folded July 13 after six weeks of operation. Only 25 of the players on a Major League Baseball team's 40-man major league reserve list may be active for the major league club, with two exceptions. One minor exception is that when a team is scheduled to play a day-night doubleheader, it is allowed to carry 26 players on the active roster for that day only. The more significant exception is that from September 1 to the end of the regular season, teams are allowed to expand their game-day rosters to 40 players. The remaining 15 players are generally either on the disabled list or play at some level of the minor leagues (usually at the AAA or AA level). Players on the 40-man reserve list are eligible for membership in the Major League Baseball Players Association. The minor league players work at the lower end of major league pay scales and are covered by all rules and player agreements of the players association. Minor league players not on the 40-man reserve list are under contract to their respective parent Major League Baseball clubs but have no union. They generally work for far less pay as they develop their skills and work their way up the ladder toward the major leagues. Many players have signing bonuses and other additional compensation that can run into the millions of dollars, although that is generally reserved for early round draft picks. Leagues operated mostly autonomously before 1902, when the majority joined the NAPBL. From then until 1915, a total of eight new and existing leagues remained independent. Most joined the National Association after one season of independence. Notable exceptions were the California League, which was independent in 1902 and from 1907–1909, the United States Baseball League, which folded during its independent 1912 season, and the Colonial League, a National Association Member that went independent in 1915 and then folded. Another independent league, the Federal League, played at a level considered major league from 1914–1915. Few independent leagues existed between 1915 and 1993. Major exceptions included the Carolina League and the Quebec-based Provincial League. The Carolina League, based in the North Carolina Piedmont region, gained a reputation as a notorious "outlaw league" during its existence from 1936–1938. The Provincial League had six teams across Quebec and was independent from 1948–1949. Similarly to early 20th-century independent leagues, it joined the National Association in 1950, playing for six more years. Independent leagues saw new growth after 1992, after the new Professional Baseball Agreement in organized baseball instituted more stringent revenue and stadium requirements on members. Over the next eight years, at least 16 independent leagues formed, of which six existed in 2002. As of 2016, seven independent leagues are in operation in the U.S. and Canada, compared to 19 in organized Minor League Baseball. The Minor League Baseball Yearly (MiLBY) Awards (formerly "This Year in Minor League Baseball Awards") are given in nine categories. In five categories (Best Starter, Best Hitter, Best Reliever, Best Game, and Best Team), winners are selected in each of the five levels of minor-league baseball (Triple-A, Double-A, Class A Advanced, Class A – Full Season, and Class A – Short Season). In three categories (Play of the Year, Moment of the Year, and Homer of the Year), one overall winner is chosen for all of minor-league baseball. In the remaining category (Promo of the Year), there are overall winners in each of five subcategories: Best Promotion (of all types), Best Theme Night, Best Giveaway, Best Celebrity Appearance, and Best Miscellaneous Promotion. John H. Johnson President's Trophy (1974) – given each year, MiLB's top award recognizes "the complete baseball franchise—based on franchise stability, contributions to league stability, contributions to baseball in the community, and promotion of the baseball industry." 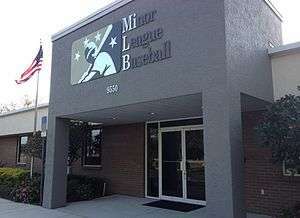 ↑ "Teams by Name – MiLB.com Official Info – The Official Site of Minor League Baseball". MiLB.com. Retrieved July 22, 2015. ↑ "Minor league teams, but mighty big numbers as franchise values soar". sportsbusinessdaily.com. Retrieved July 22, 2015. 1 2 3 4 5 "Standings". Minor League Baseball Official Website. Retrieved April 9, 2010. ↑ Shelburne, Ramona (September 1, 2010). "John Lindsey waits for his chance". ESPN. Retrieved September 28, 2010. 1 2 Moore, Jeff (July 2, 2013). "Understanding minor league levels". The Hardball Times. Retrieved November 13, 2013. ↑ "Twins Tuesday: Joe Mauer toiling for family in Cedar Rapids". FoxSports.com. Retrieved June 10, 2016. ↑ "Most minor league ballplayers earn less than half as much money as fast-food workers". For The Win. Retrieved July 22, 2015. ↑ Babb, Kent. "Baseball's minor leaguers pursue their dreams below the poverty line". WashingtonPost.com. The Washington Post. Retrieved 8 September 2016. ↑ "Umpires". MiLB.com. Retrieved March 7, 2016. ↑ Rivera, Joe. "Minor League Baseball hires first female umpire since 2007". Sporting News. Retrieved 22 June 2016. ↑ "Minor League Baseball returns to CBS Sports – MiLB.com News – The Official Site of Minor League Baseball". MiLB.com. Retrieved July 22, 2015. ↑ "Sinclair to televise Minors games on ASN – MiLB.com News – The Official Site of Minor League Baseball". MiLB.com. Retrieved July 22, 2015. ↑ "Listen Live on TuneIn Radio – MiLB.com Multimedia – The Official Site of Minor League Baseball". MiLB.com. Retrieved July 22, 2015. ↑ Kraus, Rebecca S. (2012). Minor League Baseball: Community Building Through Hometown Sports. Routledge. p. 43. ISBN 0789017563. Retrieved November 6, 2013. 1 2 3 Kraus, Rebecca S. (2012). Minor League Baseball: Community Building Through Hometown Sports. Routledge. p. 44. ISBN 0789017563. Retrieved November 6, 2013. ↑ R.G. (Hank) Utley, Scott Verner (1999). The Independent Carolina Baseball League, 1936–1938: Baseball Outlaws. ISBN 0786423188. ↑ Bjarkman, Peter C. (2005). Diamonds Around the Globe: The Encyclopedia of International Baseball. Greenwood Publishing Group. pp. 78–79. ISBN 0313322686. Retrieved November 7, 2013. ↑ Kraus, Rebecca S. (2012). Minor League Baseball: Community Building Through Hometown Sports. Routledge. p. 47. ISBN 0789017563. Retrieved November 6, 2013. ↑ In October 2009, Buster Posey received the 50th annual J.G. Taylor Spink Award as the Topps/Minor League Player of the Year. Wild, Danny (October 28, 2009). "Giants' Posey wins '09 Spink Award: Catcher skipped Double-A, dominated at San Jose, Fresno". Minor League Baseball (MiLB.com). Retrieved June 9, 2010. See also MLB 2009 Awards (MLB.com/News/Awards/2009 Awards). MLB Advanced Media, L.P. (MLB.com). Retrieved June 9, 2010. ↑ The MiLB J.G. Taylor Spink Award should not be confused with the identically named J. G. Taylor Spink Award that is the highest award given by the Baseball Writers' Association of America (BBWAA) to its members. ↑ "Topps, MiLB name Players of the Year: Trautman Award winners announced for each league". Minor League Baseball (MiLB.com). November 5, 2009. Retrieved June 9, 2010. ↑ Hill, Benjamin, "Jones slugs way to Bauman Award: Home run crown, first big league action mark milestone season", MLB.com, September 15, 2009. Minor League Baseball. Retrieved September 22, 2009. 1 2 3 4 5 6 7 "History: MiLB Major Award Winners". Minor League Baseball. Retrieved November 24, 2015. ↑ Avallone, Michael (November 19, 2007). "Minor League Baseball announces top honorees: Annual awards salute outstanding organizations and executives". Minor League Baseball. Retrieved October 22, 2009. [Presented] annually to the franchise that best exemplifies the complete Minor League Baseball organization. Categories under consideration include long-term financial stability, contributions to the industry and the community, financial success and overall promotion of the industry. 1 2 Avallone, Michael (November 19, 2007). "Minor League Baseball announces top honorees: Annual awards salute outstanding organizations and executives". Minor League Baseball. Retrieved October 22, 2009. ↑ Czerwinski, Kevin T. (December 14, 2006). "McEacharn claims 2006 Warren Giles Award". Minor League Baseball. Retrieved October 6, 2011. ↑ Avallone, Michael (November 19, 2007). "Minor League Baseball announces top honorees: Annual awards salute outstanding organizations and executives". Minor League Baseball. Retrieved October 22, 2009. The award recognize[s] the team's special tie with its community through unique promotions, a commitment to area events and support for charitable endeavors. ↑ Top 100 Teams (1901–2001). Minor League Baseball. Retrieved August 19, 2010.